First off, sorry if I say something stupid. I'm probably not as experienced as most of you are. I recently took my PC in to be repaired and they said that the issue was that the powersupply was losing power intermittently. There was a brief note at the end that I might consider buying a new pc, and that bothers me - I really don't think the issue is so bad that I need a new PC altogether. I could be wrong, but apparently my motherboard, ram, graphics card, CPU, hard drive etc. are all fine and I'm just really not in a position to drop a couple of thousand dollars for a new machine right now. Basically, I'm afraid they're trying to swindle me into buying a new PC, and I'd like to go in with some knowledge. I've emailed them to ask if I can just buy a new power supply and have them replace it, but I'd like to be prepared for pushback. They did say that they had some issue running diagnostics as I have a unique power supply and motherboard. I called the service line and they said that it would not be possible to replace because it has a 'unique' power supply. I tried to ask what the issue was - physical dimensions, mounting, connectors - but it seems the poor customer service girl isn't the technician so I can't really press her for that info. The 'unique system' thing sounds a little bit like an excuse. They seem to really be pushing for me to buy a new system, which sounds like bull to me. The customer service girl told me I could come pick it up (which would mean paying the repair fee, when it hasn't been repaired) but I really don't want to do that now, since once I pick it up the repair is 'done' and the repair cost is supposed to include the cost of installing any new parts (like the power supply). Planning on going in person to speak to the technician and make him explain to me why it's apparently 'impossible' to replace the PSU. Does the r4 have a proprietary powersupply? If so, this could explain why it is hard to upgrade? Have R4 owners been able to upgrade or replace their power supply in the past? Does it sound like the store is trying to swindle me/ doesn't know what they're doing? If anyone has upgraded their powersupply, would you be able to suggest what to upgrade it to? Find great deals on eBay for alienware 875. Shop with confidence. I have the basic Aurora, the one with the honeycomb-like top instead of the ALX. So, would the case harness being unique constitute such a difficulty to replace/upgrade that it's not worth it to do? All other parts of my PC (graphics cards, hard drives, SSD, CPU) are functioning fine, and this feels like a ploy to get me to spend $3000 on a new machine without even trying to fix the old one. If I'm understanding it correctly, it should be possible to either replace the PSU with the same exact model as the standard, or even to swap to a different power supply, correct? It seems like this powersupply has that one very big single connecter, where as its more common (I think?) to see more smaller connectors. Could this present an issue? Thank you again for being so thorough and so quick in your responses - you really are a lifesaver. My apologies for being dense, but I've never had to do a PSU replacement so it appears I'm missing some basic knowledge about terms. What do you mean by 'harness' and 'chassis'? A google image search of those terms only confused me more. 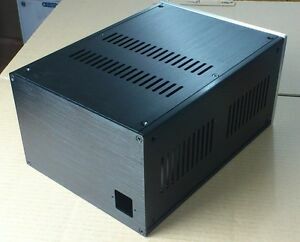 From context, I presume the PSU goes into the chassis, which is a metal exterior 'shell', looking something like this? Would you be able to give an example of where to buy a bare chassis without cables online, so I don't accidentally buy the wrong thing? Would buying something like this include the harness, chassis, or cables, or would I have to buy those separately?